Speccy v1.31.732 is mis-identifying an AMD Phenom-II X2 model 555 as a Phenom-II X4 model 960, but only in name. Speccy is correctly indicating that there are 2 CPU cores, 2 threads total, etc, etc, but is naming the CPU incorrectly (X4 versus X2, which then also leads to incorrect model-number). FYI: Host system is Dell Optiplex 740E; AM2+ socket. Forgot to mention: this misnaming of this particular CPU occurs under Vista, Windows 7, and Windows 10. Haven't (yet) tried under XP or Win8. 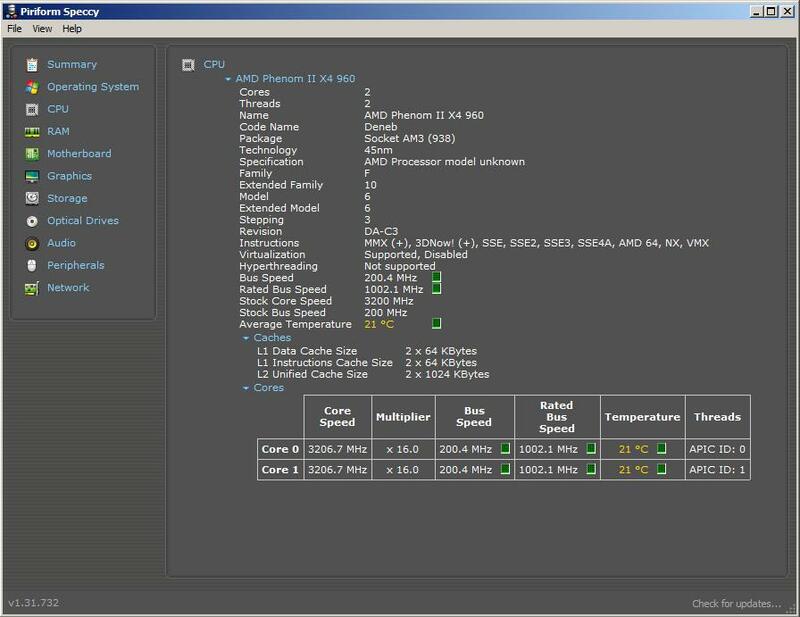 This CPU-model misidentification appears to also cause incorrect CPU temperature report: in a room where the ambient temperature is 19.5 Celcius (measured with both glass-alcohol thermometer and glass-mercury thermometer), Speccy reports the CPU temp as 10 Celcius even though the chassis fan is hardly turning. Conversely, when running dual-core Prime95 for several hours, in the same room at the same ambient temperature, Speccy reports the max CPU temperature as just 26 Celcius, which can't be right. Presumably, because the Phenom-II X2 is internally a quad-core processor with two cores hard-disabled, the raw sensor numbers read are being mistranslated into temperature. start an elevated command prompt and type in WMIC and hit Enter. then type cpu get name and hit Enter. if that shows your processor as a X4 than Speccy is passing on what the manufacture has entered in the firmware field for that description. On some Callisto dual core processors e.g. 555 BE, the two disabled cores can be enabled, effectively providing a quad core processor for the price of a dual core. This however does not work on all the processors with two cores disabled. and where is the L3-cache?